Tiny Raspberry Pi-like computers and PCs-on-a-stick have become all the rage these days, and here's another Pi derivative which is extremely cheap indeed. The Orange Pi One will set you back just £9.90 and that price includes shipping from Aliexpress.com (if you're in the US, including shipping it will cost $14, which is around AU$20). 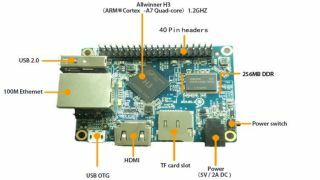 As Liliputing reports, for your tenner, you get a board which sports a 1.2GHz quad-core ARM Cortex-A7 CPU with a Mali-400MP2 graphics solution running at 600MHz and 512MB of DDR3 system memory. And you get a pretty decent complement of ports, including a micro-USB port, USB 2.0, 10/100 Ethernet and an HDMI out. There's also a microSD slot and a 40-pin Raspberry Pi-compatible header, plus there's a camera interface on the back of the board. As for the size, the Orange Pi One measures 69 x 48mm and weighs 36 grams. That's just a touch larger than budget rival the Raspberry Pi Zero which measures 65 x 30mm. Of course, at four quid the Pi Zero costs less than half the amount of the Orange Pi One, but it has a slower 1GHz processor and not quite as much on the port front (there's no Ethernet port on the Zero, for example). Essentially, this is an interesting Pi Zero alternative, particularly given that stock of the Pi Zero is still, well, zero at some suppliers at least in the UK.